This Inspira Quilt Frame is setup with a Viking Husqvarna Mega Quilter sewing machine – a short-arm quilting machine. This machine is high shank, straight stitch only machine with a large throat that produces up to 1600 stitches per minute. It can be used with or without the Inspira Quilting Frame. It comes with a built in bobbin winder (motor independent from sewing motor) and large extension table when used on a table-top surface. This is an original Inspira Quilt Frame with the high (or upper) pantograph shelf designed to work with short-arm sewing/quilting machines. Frame can be setup in either a 5’ or 10’ configuration, offering quilting flexibility. The 5’ frame is perfect for small spaces with a much smaller footprint while the 10’ configuration allows larger quilting capabilities. In the 10’ configuration, the footprint is 120”x33”. Please measure your room for fit. The machine featured in pictures is in its 10’ configuration. It is not ideal for this frame be placed against the wall on either end. The frame can be placed fairly close to the wall on the backside of the machine, allowing only enough space for the cables to move freely behind the machine carriage in the back most position. The frame does not come with casters, however, installing casters/rollers on the quilt frame will allow you to easily move the machine away from the wall as needed while maintaining maximum floor space while not in use. I recommend a heavy duty extension cord that will extend from your wall plug to the center of the frame. These can be found at Lowe’s or Home Depot. I purchased this frame in December 2017 and have LOVED having it. There is nothing wrong with the frame. It is adequate for those with small spaces or are looking to try before they invest in a long arm. This machine has been perfect for me. 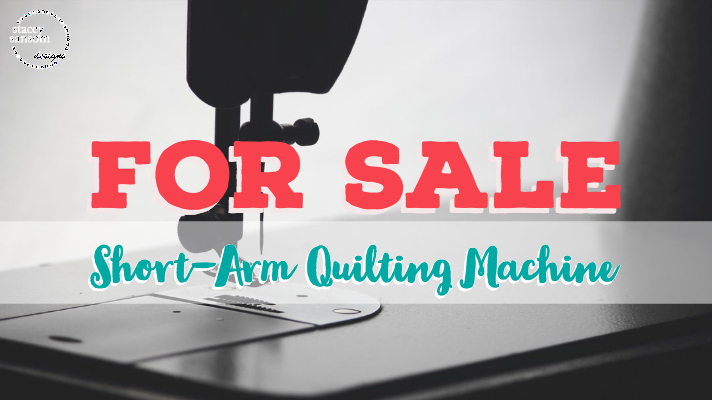 The only reason I am even considering selling it right now is because I have been gifted a 30” long-arm quilting machine and frame. I need this gone! Considering the age of the quilting frame, it is in remarkable condition. I bought the frame used and had to put about $150 worth of parts and maintenance into it to get it up and running smoothly. The previous owner had stored it in her HOT Texas outdoor shed for an extended period of time. I spent a great deal of time and detail in cleaning the frame up and restoring it to its current condition. Most problems on the frame are cosmetic only. † In spite of this, the machine could use new leaders. They were washed in an attempt to clean them after lengthy storage on a hot Texas outdoor shed. There was some shrinkage, but I have been using them as most of my work is Full/Queen or smaller. I recommend that they be replaced with leaders of your choice. These can be bought from a variety of retail locations and online. You will need to purchase additional hook/loop tape to reattach the new leaders unless you opt to use another method. You will have to research leader compatibility. Current leaders on the machine are attached to the roller bars via long continuous hook and loop tape. This can be purchased online in bulk for optimal pricing. This is a wear item. ◊ Frame does NOT come with pantographs. I did not receive any when I purchased it. I have never purchased any since purchase. I have hand drawn patterns as needed onto paper and copied for repeat patterns. I have also used a dry erase pen to draw directly on the pantograph shelf. Mostly I have done freehand so having pantographs has never been an issue. It is recommended that you use 4.5-5” pantographs with this machine especially on larger quilts. You are limited by the distance between the rollers (with quilt loaded this is a shorter distance as you proceed through the quilt). ∂ The rollers included will be in their 10’ configuration. Three of the four rollers already have hook and loop tape on them for the attachment of the frame leaders. The fourth roller designed to hold the batting, requires hook and loop dots or squares. These offer just enough to grip the batting, but not hold it so strongly it will rip holes in the batting. Unfortunately, these loop dots do not stay on the machine long-term. I tried keep several packages handy for replacement as needed on the batting roller. The rollers with the leaders for loading a quilt onto the machine already have long continuous hook and loop tape. The lowest roller, intended to hold the batting, requires hook and loop dots or squares. These could be substituted for something else, if you desired. The dots have a tend to fall off with frequent use. ª The Quilter Cruise Control Stitch Regulator is the original with the frame. The o-rings need to be replaced on the device sensors. I purchased replacements in August 2018, but I have been so busy with other sewing work that I have not had a chance to install them and use them machine. These are required to properly run the Cruise Control. These o-rings are a wear item and should be replaced fairly regularly as they tend to crack and get worn. If the machine appears to be doing wonky things with the stitches, it is usually the tension of the thread, the tension of the quilt on the frame, or the 0-rings. The frame works with or without the Cruise Control. With practice and patience, you can get smooth and even quilting without the Cruise Control attached. Frame does NOT come with, but is compatible with the QBOT Robotic/Automated Quilting unit. You can research this on your own if you are interested in computerizing the machine and frame set-up. Like I’ve previously said, I have truly enjoyed having this machine. There is nothing fundamentally wrong with the machine. The machine stitches beautifully on or off the frame. This little (or not so little) beauty is sure to please anyone who is wanting to quilt their own quilts and are not wanting to jump into the investment of a full long-arm quilter. It needs to be oiled frequently, especially when you have the heater running during the winter. I purchased the included Oiling Pen at the Arlington Sewing Center. If you use it frequently, you will need to oil it more often. If it sits a few days without use, it still needs to be oiled. The directions for oiling are in the included original manual. Please make sure you use the needle type listed in the manual. They can be ordered online if you cannot find them local to you. The machine only comes with the original darning/free motion quilting foot that came with the machine when I purchased it. No other feet will be included with the machine. I have never purchased any because I have used the machine on the Inspira Frame 99% of the time. I do freehand work so I’ve never needed an open-toe hopper foot. You will have to look online and see what will fit the machine. Please note that the new darning place on the machine was a Janome plate. The Denton Sewing Center were the ones that ordered this compatible darning plate for me. You may choose to purchase additional feet and/or a different free motion quilting foot. This Inspira Quilt Frame are (1) the height, (2) the pantograph shelf and (3) lack of lighting. 1. The original Inspira Quilting Frame was designed for ease of use with the high/upper pantograph shelf. It is comfortable to use as a sit down machine if you prefer to sit. I recommend a rolling chair or stool for this. A support frame could be made to hold the frame adjusting it to a comfortable standing height if desired. My husband had intended to build me something, but we had not gotten to it yet. 2. The pantograph shelf is small. It bows in the middle due to something heavy being set on it by the original owner. Please note: the pantograph shelf is NOT intended to be a shelf. It is intended for pantographs only. This bowing is normal for this frame. The pantograph shelf could be replaced with something sturdier but it is not a problem overall. You just need something that will not bow when spanning just shy of 10’ of space. 3. The lack of lighting is common with most short-arm machines. I will confess that my room is poorly lit. The upper shelf does cover part of the work area thus blocking light. As a work around for this, I used Command Hooks (type) to hang small LED lights along the back of the pantograph shelf. This increased lighting on the quilt overall while working. I have the machine in front of a wall of large picture frame windows so use natural lighting during the day. When I need to work on darker colors or colors where it hard to see the thread, I have used a clamp heat/grow lamp and replaced the bulb with LED flood lights. These clamp nicely on either end of the machine. Lighting will not be included with this frame. The hooks will stay on the back of the shelf, however, you will need to experiment with what is best for lighting in your room and personal lighting needs. This Viking Hursqvarna Mega Quilter Short-arm machine and Inspira Frame will not be sold individually.